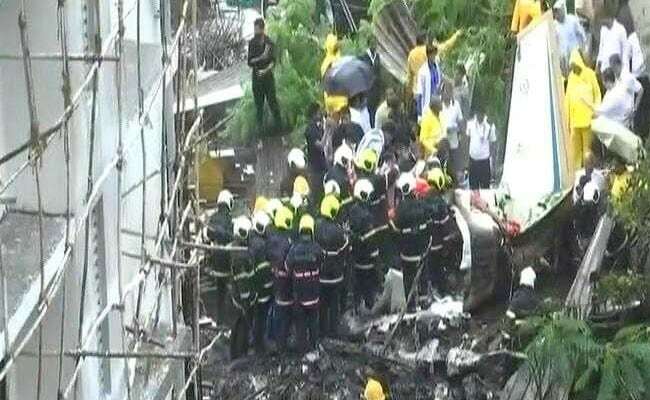 Five people were killed after a small plane crashed into a construction site in a thickly populated suburb of Mumbai this afternoon. The plane was about to land at the Mumbai airport when it crashed some distance away in Ghatkopar, killing all four on board - two pilots and two maintenance engineers. One man was also killed as the plane crashed at a spot that sits next to several high-rise residential buildings. The plane, a Beechcraft King Air C 90 turboprop, was sold by the Uttar Pradesh government to a Mumbai-based UY aviation company in 2014. "The deal was done after the plane had met with an accident in Allahabad," UP official Avnish Awasthi was quoted as telling ANI. Former civil aviation minister Praful Patel tweeted that the pilot saved many lives at the cost of her own, by swerving to avoid crashing in a busy area. Saddened to hear about the unfortunate incident at #ghatkopar as Charter plane crashes in an open area. Salute to the pilot who showed presence of mind to avoid a big mishap, saving many lives at the cost of her own life. #RIP to all the 5 Dead. My deepest condolences. According to the Directorate General of Civil Aviation or DGCA, the 12-seater plane had taken off from the Juhu airstrip on a test flight. In visuals on TV and social media, flames and black smoke were seen rising from the wreckage. A large crowd gathered around the debris, many carrying umbrellas in the rain, as firemen sifted through the debris. "There was a huge explosion and the adjacent tree caught fire and the fire spilled on the streets," a man told NDTV. The plane crashed through the boundary wall of the under construction residential complex and burst into flames leaving a strong smell of aviation fuel all over the area. Aircraft parts like the engines, propellers and landing gear were completely burnt even before the fire brigade could reach the spot. "Initially we assumed an electric box in the under construction building must have caught fire but when we checked out the spot, we found the charred body of a man who apparently was on bike when the plane crashed," he added. It took over an hour to put out the fire. The black box of the aircraft has been recovered and the DGCA has already started a preliminary probe into what caused the crash. Teams from the DGCA and Aircraft Rescue and Firefighting or ARFF have already begun collecting evidence from the crash site. "There was a loud bang and then we saw the plane," said a teenager who lives in the neighbourhood. A resident of an apartment complex, Patel Niwas, added: "We are used to planes flying overhead. We thought there was an explosion at the construction site. Only later we realized that a plane had crashed."